She might be well over a century old, but this neoclassical Grande Dame still captures the imagination of travellers coming to the Greek capital. From rockstar royalty to heads of state, everyone who’s someone makes the “GB” their port of call while in Athens. Built in 1842, and found right at the heart of the Constitution Square, you’ll find no other hotel as closely linked to the city’s history,- and its present- as the Hotel Grande Bretagne. Be prepared for a succession of uniquely Greek experiences and a hotel with a sense of place. From the comfort of the Alexander’s Bar terrace, guests sip on cocktails while watching the changing of the guards unfold in Syntagma Square below. The most romantic tête-à-tête in Athens is found at the GB Roof Garden restaurant terrace where al fresco dinners come with uninterrupted views of the Acropolis and Lycabettus Hill, while afternoon tea amid the floral displays of the Winter Garden is practically a rite of passage for the city’s well-to-do. For undiluted Old World opulence with the service to match, the Hotel Grande Bretagne still holds the crown. Discover a historic landmark in the heart of Athens. Within walking distance of exclusive shopping areas and museums, the hotel enjoys the ideal location in the city centre. Indulge yourself within the multi-awarded GB Spa. Ideal place to visit with the family. The swimming pool, saunas and gym are perfect. A very nice hotel, great location, very nice room. 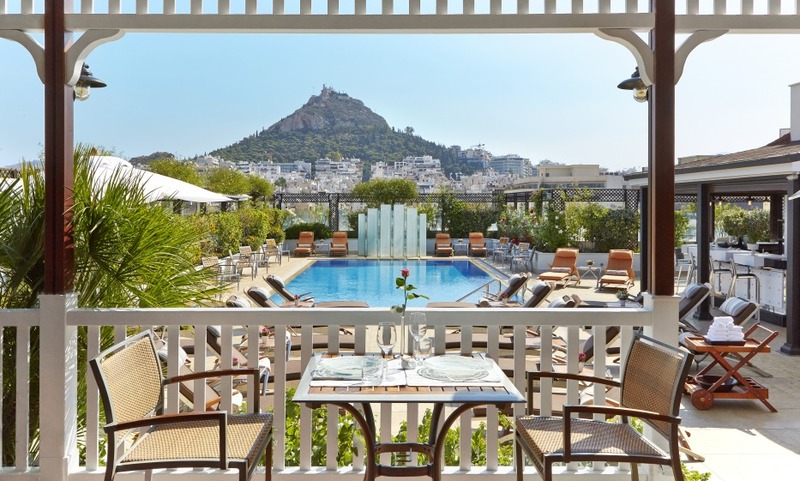 Breakfast, dinner and bar on the rooftop terrace with beautiful views of the city and the Acropolis is the must of the property with good products and good service. Beautiful hotel. Lovely people. Small but nice room. Loved the hotel. We were also upgraded to the butler service floor and our butler George was exceptional helpful and welcoming. The hotel is very well located and all the important places to visit are accessible on foot. It’s a charming place even though the design is a bit to dated for my tastes. The restaurant is excellent and gives right onto the Parthenon. The hotel Grande Bretagne is a very beautiful and stylish hotel. My husband and I have stayed in many hotels around the world and would have to rate this hotel among the best. Thank you for a very pleasurable stay. Very good hotel in general and helpful staff. Not sure why there is internet charges considering the amount that is being paid for a room and when you can get free internet across the road in a simple café! !